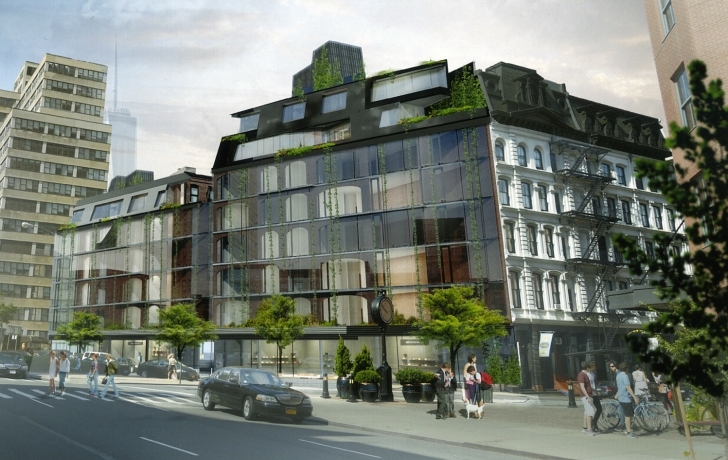 Developers are gearing up to put a glass-faced residential building on two oddly shaped lots—now parking lots—in Tribeca. Its design, the neighbors complain, is an affront to their block. The proposal, for a shiny eight-story building at 100 Franklin Street, with a highly modern interpretation of a man­sard roof, is due to go before the Land­marks Preservation Commission on Nov. 12 for the first of several city approvals that are required of the developer, DDG Partners. About 20 people, most of whom live close to the site—a parking lot since 1949—came to Community Board 1’s monthly full board meeting on Oct. 22 to say that the building’s design does not fit the character of the neighborhood. “The fabric of historic Tribeca is being taken over by these modern developments,” said David Schoonmaker, also of 17 White St. The proposed building, actually two connected tri­­angular structures with a single glass front, would stand on the south­ernmost block of Sixth Avenue, be­tween White and Franklin streets, with an entrance on Frank­lin. The unusual facade would be four-layered—a sheet of outside glazing, with brick arches and structural material behind the glass and, behind that, the apartment windows that open within the building. The design also calls for vine-wrapped cables to hang from the building. The northern end would come to a point next to 17 White Street, a handsome 1868 apartment building with a mansard roof that inspired DDG to come up with mansard roofs of its own for the north and south penthouses. The more prominent of the two penthouses, on the larger northern building, is grey and angular with a cantilevered second story that hangs over the apartment’s terrace. That resolution didn’t sit well with the group that came out to speak against the project, some whom had told the committee earlier in the month that they worried about the impact of construction on hurricane damaged 17 White Street. They condemned the entire design at the full board meeting, and called for a reconsideration of the plans. The board voted to table the resolution, giving the residents more time to study the plans and meet with CB1’s Landmarks Committee on Nov. 7, in advance of the Landmarks Com­mission hearing. — Aline Reynolds contributed reporting. Submitted by admin on Mon, 11/04/2013 - 4:31pm. its original mandate to scrupulously preserve and protect New York City’s architectural heritage. As a result of unbridled development, this rich and irreplaceable heritage is under threat. “Fueled by lax zoning laws, cheap capital and the rise of a global elite with millions to spend on pieds-à-terre,” (See 10/28 NYT Op-Ed, “Shadows Over Central Park”.) Tribeca, much like the neighborhoods surrounding Central Park, is being severely compromised by unchecked real estate speculation. Much of Tribeca falls under Landmark designation. Residents of landmarked buildings must comply with stringent rules for any exterior alteration whatsoever, regardless of how miniscule these alterations may be. Additionally, the residents of such landmarked buildings work inordinately hard to care for their historic dwellings. By contrast, the development of in-fill sites, which themselves may be landmarked, is virtually a free-for-all in terms of design. Although it may not be spoken, it is fully known that these developments are all about lining the pockets of investor groups who have immense influence with the city and have no regard for what they leave in their wake. sector of 19th Century treasures. It is an affront, in particular, to the classic Second Empire building directly adjacent to the lot’s north end. The 1868 building will effectively be erased from the East and Northeast, where it is presently most dramatically visible. There is a circlet of buildings, all of the same period, running up and down Franklin and White Streets that will be similarly damaged. The historic injury does not even begin to address the devastating effects of the new development on the trees, the light, the air circulation and the charm of the existing, unusually broad alley way that connects the north and south ends of these two small triangular parcels. We are appealing to the community, CB1 and the Landmarks Preservation Commission to honestly and disinterestedly assume their appointed roles and obligations to protect the Historic District and reject this proposed design.